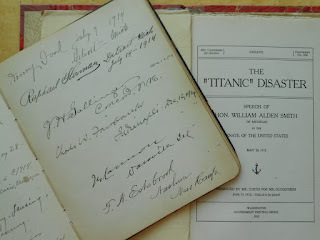 In a previous posting, we highlighted how the local media in Mid-Michigan reported the sinking of the RMS Titanic to reflect on the 100th anniversary of the ill-fated voyage. Six weeks after the sinking, on May 28, 1912, U.S. Senator William Alden Smith of Michigan spoke in front of Senate regarding his subcommittee’s findings regarding the Titanic disaster. In his speech, Senator Smith, pulling from testimony that was given before his subcommittee, recounted the events as they unfolded from the time passengers boarded the ship to the rescue by the Carpathia. The focus of his speech was the lessons to be learned from the tragedy. At the Clarke Historical Library, we maintain a presentation copy of this speech printed by Government Printing Office. We also hold other materials related to Senator Smith, including the guest book from his time as a U. S. Senator. Signatories in his guest book include constituents, friends and associates from Grand Rapids, and notable individuals in higher education, politics, and business. Some famous names in Senator Smith’s guest book are Woodbridge N. Ferris, founder of Ferris State University and 28th Governor of Michigan; J. L. Snyder, President of Michigan Agricultural College; Frank B. Kellogg, Minnesota Senator and Nobel Peace Prize laureate; Arthur Vandenberg, a Grand Rapids newspaperman who would later be elected to the U. S. Senate; Thomas R. Mitchell, Vice President of the United States; Senator Warren G. Harding, who would later be the 29th President of the United States; and Henry Ford (pictured above - click to enlarge). These documents are just two of the items dealing with American politics held in the Clarke Historical Library, which include a large U. S. presidential campaign biography collection, the multi-volume Messages of the governors of Michigan, and the papers of Senator Robert P. Griffin. 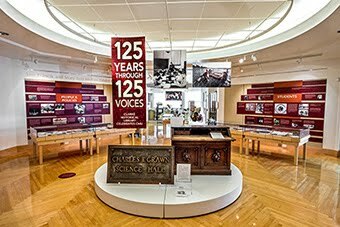 The role played by Michigan politicians in the events that have shaped the world can be found at the Clarke Historical Library.